Formed in 1976, the Cure is one of the few bands that emerged from England during the punk explosion to endure far beyond that scene and evolve into a significant band. The Cure laid the groundwork for the goth-rock genre, and are now generally considered to be that genre's defining band. Despite a stated resistance to the mainstream, the band crossed over and became a commercial success. Singer/guitarist Robert Smith has always drawn more attention for his freakish appearance (smeared makeup, wildly teased hair) than for his music, which has remained unique and diverse. A few obscure recordings from the Cure's past are now out of print. In 1981, when gloom-and-doom was becoming the Cure's distinct style, the band recorded a music score for a film that the brother of bassist Simon Gallup had been working on. The resulting Carnage Visors cassette is a seamless and fairly simple 27-minute instrumental. Although it holds no surprises (it wasn't meant to stand alone, after all), Carnage Visors is a fairly absorbing little mood piece. In the '80's, Carnage Visors was available as part of a double-length cassette, in which it was paired with the band's 1981 album Faith (Faith/Carnage Visors, Elektra 9 60783-4), which made quite a downbeat double-bill. In 2005, Faith was reissued as a 2-CD deluxe edition with "Carnage Visors" as a bonus track. Between 1978 and 1985, the Cure performed live in the studio on six occasions for the John Peel Show on England's Radio One. 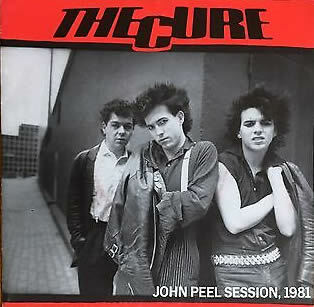 Aside from a 1988 EP containing the 1978 session (more on that later), the only other Peel session released as a legitimate item was a three-song, 7-inch single consisting of tracks from the 1981 session. The packaging (which folded out into a poster) correctly named the band and songs, but the sticker on the vinyl called the group "Bob Smith's Combo", and gave false names to the songs! The combo consisted of Smith, drummer Laurence Tolhurst, and bassist Simon Gallup. The three songs were taken from the Faith album; one of them, the "yellow version" of "Primary", has alternate lyrics that are curiously flighty. The songs are played very well, though they inevitably lose much of their atmosphere in this setting. Released in 1983, Japanese Whispers consists of the four tracks from an EP called The Walk, along with the A- and B-sides from two singles. Those singles ("Let's Go To Bed", "The Love Cats") and their respective B-sides ("Just One Kiss", "Speak My Language") are the better tracks; they show a more playful side of the Cure than the three gloomy albums that preceded this one. Meanwhile, the songs from The Walk are in the same basic vein as those albums, but have more shimmering production values. Japanese Whispers finds the Cure in something of a transition from goth-rock to more pop-oriented songs. That transition was momentarily interrupted by The Top, which like The Walk EP continued the same gloom-and-doom approach but was more slickly produced than the earlier albums. "Over The Top" might have been a better title; although the album is never boring, it sometimes hits you over the head with its atmospheric mood pieces. Still, there's plenty here to stimulate the senses. "Wailing Wall", "Dressing Up", and "The Empty World" make the best impressions. (Note: The Top was reissued in a deluxe edition in August 2006, with a whole second disc full of demos and live cuts). Concert: The Cure Live has never been released in the U.S. Recorded over four different dates in London and Oxford in May 1984, the album contains live performances of songs from the albums that were recorded up to that point. The live versions don't sound much different from the studio versions, but fans of the band's early work will want to add this album to their collection. "The Walk" and the selections from The Top ("Shake Dog Shake", "Give Me It") are preferable to the bloated studio originals. Many cassette versions of this album are double-sided, with a second side loaded with 10 more live cuts (including an early studio demo of "Boys Don't Cry") recorded between 1977 and 1984. The earliest track, titled "Heroin Face", is a hard-rock number from a late-'77 club date. 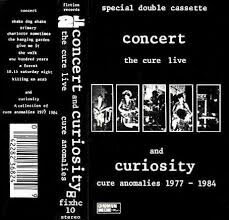 This cassette version is titled Concert (The Cure Live) And Curiosity (Cure Anomalies 1977 - 1984). All ten of these additional tracks can now be found as bonus tracks on Deluxe Editions of the Cure's first five studio albums. Download 'em all! The four-song Peel Session EP from 1988 features the original trio of Smith, bassist Mick Dempsey, and drummer Laurence Tolhurst performing live in the studio in December 1978 for the John Peel Show on England's Radio One. This EP has come in many different packages, with countless forms of cover art; some vinyl editions were pressed in either colored vinyl or picture discs. It's good stuff, providing another short glimpse of the group's original stripped-down punk ethos. However, as was the case with many other artists' EPs from the Peel Sessions series, these tracks have a cleaner sound quality than they did in the original radio broadcast, making them sound more produced than live-in-the-studio. 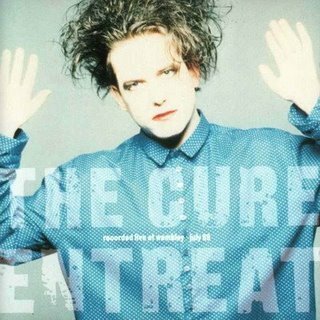 The Entreat live album was originally a promotional giveaway in the U.K., but was later released as a commercial item there. Recorded at the Wembley Arena in London in July 1989, the record contains performances of eight of the twelve songs from the band's enormously popular (and enormously depressing) 1989 album Disintegration. 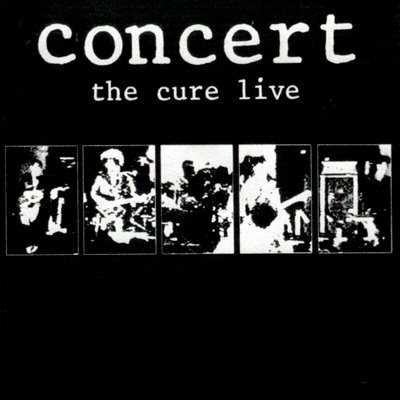 As is the case with most live Cure recordings, the live versions sound very similar to the studio versions, but it is notably impressive how well Smith and company can recreate the album's foreboding mood in a live arena setting. In June 2010, the complete Entreat concert (featuring all 12 songs from Disintegration in sequence) was included as a bonus disc for the deluxe edition of Disintegration. In 1993, the Cure simultaneously released two different live albums. One of them, titled Show, was a companion piece to a filmed Detroit concert that was released on VHS under the same title. In most countries, Show was released as a 2-CD set, but in America it was only released as a single CD with four tracks omitted. Elektra may have felt that a double-disc set was too much to put out on the same day as Paris. However, those remaining four tracks (along with the same version of "Just Like Heaven" from the album) were made available on an EP called Sideshow, which is no longer in print. It may have seemed like overkill at the time, but on its own, Sideshow is a good EP. It contains a tape-recorded instrumental intro played at the beginning of the concert (interesting), solid performances of "Fascination Street" and "The Walk", and a passable performance of "Let's Go To Bed". For best results, Sideshow should probably not be listened to on the same day as Show and/or Paris so that it won't seem redundant. 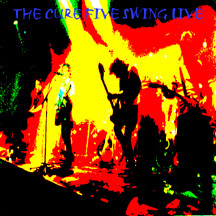 Five Swing Live was a five-song EP which was only available from the Cure's official website in a 5000-CD limited edition. It contains live performances from the UK leg of the Wild Mood Swings tour, recorded in December 1996. "Trap" was recorded in Manchester, "Mint Car" in Sheffield, and the other three in Birmingham. The Wild Mood Swings album was nearly as uneven and unfocused as its title suggested, but the five songs selected for this 20-minute EP make for a more concise and coherent disc. The band (which had recently undergone two membership changes) does well with these selections, although (as usual) the live versions don't differ much from the studio originals. Still, Five Swing Live is worth searching out for Cure devotees. The 2001 release Greatest Hits was far from the first Cure compilation, and it surely wasn't the most comprehensive. True to its title, it contained the actual hit singles ("Just Like Heaven", "Lovesong", "Friday I'm In Love") as well as several alt-rock radio staples ("Boys Don't Cry", "Let's Go To Bed", "Why Can't I Be You? "), but didn't concern itself with digging much deeper. What sets this 18-track collection apart from other compilations is the inclusion of two decent cuts that were previously unreleased ("Cut Here", "Just Say Yes"), and two negligible ones ("Never Enough", "Wrong Number") that were previously issued as bonus tracks on other compilations. The regular single-CD version of Greatest Hits is in print, but the double-CD limited edition is no longer available. The second disc, titled Acoustic Hits, contained live-in-the-studio acoustic recordings of the same 18 tracks. It was a good gimmick, and a good disc as well. Some would gripe that many songs lack the necessary atmosphere of the electric versions, but non-purists should find the acoustic versions interesting at the very least. Songs like "Why Can't I Be You?" or "High" may suffer a bit in this setting, but some others ("Never Enough", "Wrong Number") actually benefit from less turgid arrangements. The dreamlike qualities of certain songs ("A Forest", "Lullaby", "Mint Car") are brought into sharper focus in these acoustic renditions, arguably giving them a new down-to-earth twist. The songs are played well all around. This edition is worth finding. (Note: A limited edition vinyl double picture disc of Acoustic Hits was released on Record Store Day 2017, limited to 3,250 copies. Later the same year, Acoustic Hits was also issued as a regular black vinyl 2-LP set). 8. Why Can't I Be You? The second disc of the limited edition contained acoustic versions of the same 18 tracks in the same sequence.